What better way to improve your quilting skills than with practice. Skillbuilder makes this possible. 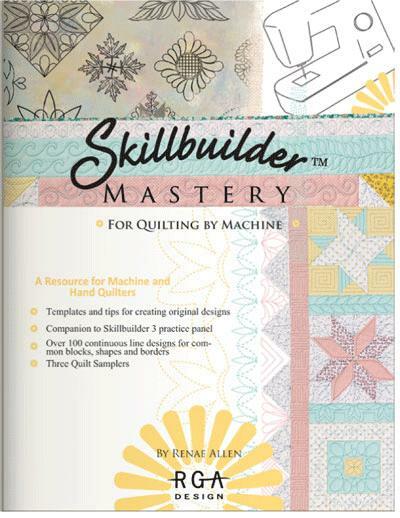 Skillbuilder has been designed to be an aid to improve your quilting skills. It is essentially a step-by-step guide to gaining confidence with your own abilities. Starting with Skillbuilder 1, you'll gain confidence with handling the fabric with the sewing machine and improving accuracy with simple blocks. Skillbuilder 2 introduces more difficult blocks by way of feather patterns. Skillbuilder 3 - Mastery again takes a further step by introducing more complex blocks and patterns again. Finally, Design Builder encourages you to design your own patterns. If you feel that you need to build confidence with your accuracy levels, we recommend that you start with Skillbuilder 1. If you feel more confident, start at a level that best suits you. Skillbuilder is available as easy to understand Books, try with Practice Panels or as instructional CD's and DVD's. The Skillbuilder Companion guidebook is packed with clear photographs and excellent illustrations making it an ideal resource for individual and classes learning to quilt by machine. 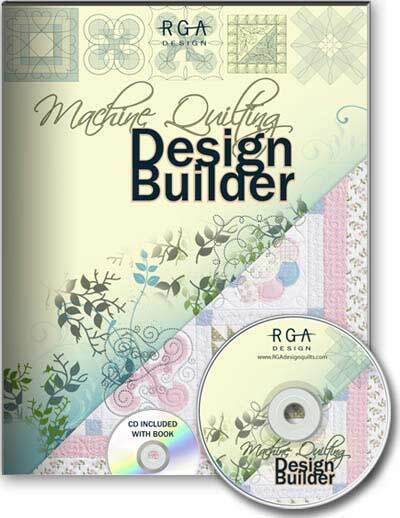 It contains step by step instructions for quilting skillbuilder practice panels. The easy to read instructions emphasise techniques and provides ample tips for the continuing learner. 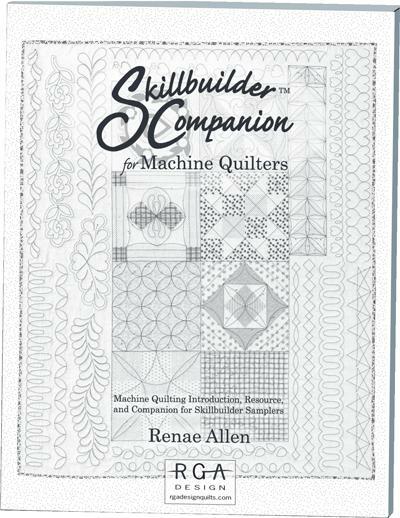 Skillbuilder Companion will also serve as a reference, resource and reminder for experienced quilters. The Skillbuilder Mastery Workbook is packed with full colour examples and explanations, showing the novice exactly how to select, transfer and create impressive and beautiful original designs. Along with tips and suggestions, the Skillbuilder Mastery Workbook spills all the secrets many quilting experts have taken years to learn by trial and error. As a resource book, it contains templates and continuous line designs for the essential square, triangle, star and octagon shapes. The Design Builder Book and CD introduce the art of matching quilt patterns to specific motifs for artistic and eye-pleasing quilt designs. Illustrating twelve different quilt patterns for each of the six blocks on the Design Builder fabric, the Book and CD introduce hundreds of design possibilities. As always, the book is packed with insider tips and tricks, this time introducing long arm skills and the use of pattern transfer tools for creating lifetime treasures of your own design. Enhance your machine quilting skill, accuracy and creative potential using Skillbuilder ready-to-stitch design prints. Skillbuilder 1 fabric panels feature 16 printed border patterns, 9 unique blocks and 3 motifs, providing hours of practice for new and experienced machine quilters. Follow the starting points and directional guides to stitch your way to machine quilting confidence. Order per panel. Feather patterns add a unique balance of simple beauty and classical sophistication to a quilt. Skillbuilder 2 pre-printed practice fabric panels feature 26 feather themed designs to bolster the confidence of even first time machine quilters. Order per panel. Ready to begin designing your own quilt patterns? Become the designer with this all-new full colour print panel enabling easy hands-on practicing of more than twelve unique quilt patterns from elegant to intricate for each of the six traditional blocks printed on the panel. 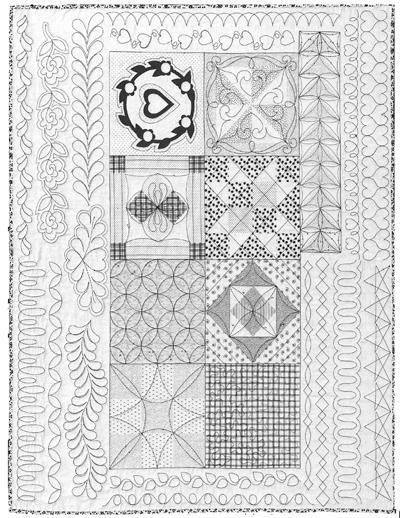 Quilting lines are omitted to allow freehand pattern practice, design choice and use of aids such as templates, rulers and pantographs. 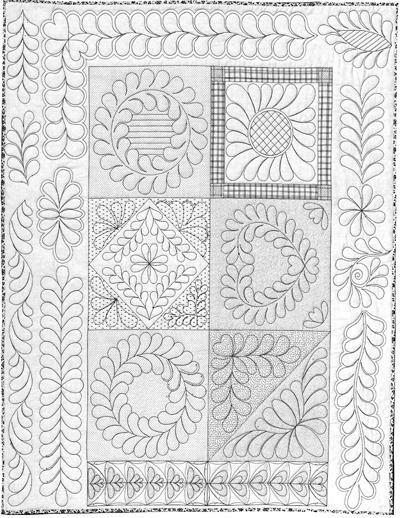 The "Tips and Tricks" throughout the companion book give suggestions for both traditional and long arm quilting, plus designs for borders, sashings and corner posts. 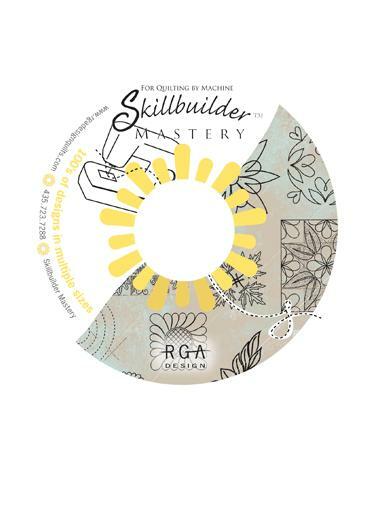 The Skillbuilder Mastery CD-ROM allows learners to print new quilting designs in multiple sizes. It includes designs in Skillbuilder Mastery book and on the Skillbuilder 3 practice panel. The CD-ROM also contains designs from Skillbuilder 1 & 2 panels and many more. 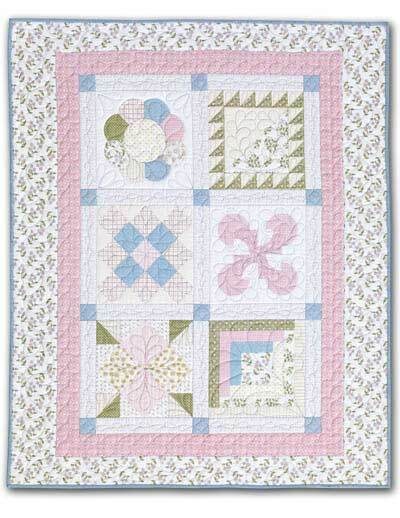 A picture gallery shows all three Skillbuilders, three sampler quilts and a feathered baby quilt. The CD also has a conversion calculator for determining percentages to enlarge or reduce designs. Skillbuilder Mastery CD is user friendly, self contained and requires no additional software to run. Skillbuilder Studio Volume 1 is a wonderful introduction to the tools and skills needed to create your own beautiful quilts. Through simple step-by-step instructions, Renae demonstrates the knowledge and techniques needed to become a proficient machine quilter. Whether you want to follow patterns and lines or learn to freehand, Skillbuilder Studio is the way to explore fabulous possibilities. Discover invaluable tips and quilting secrets that make the process easy and effective. 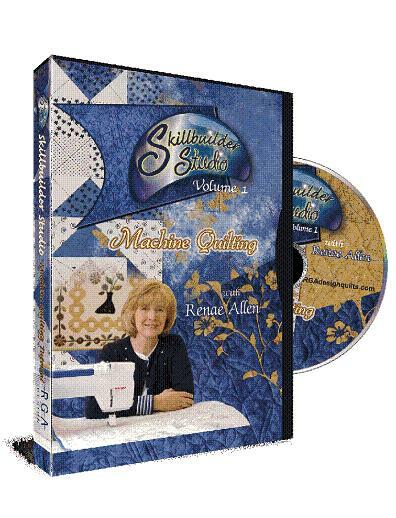 With this DVD you can "take the class home" to learn in your own "quilting studio". Running time: approximately 120 minutes. 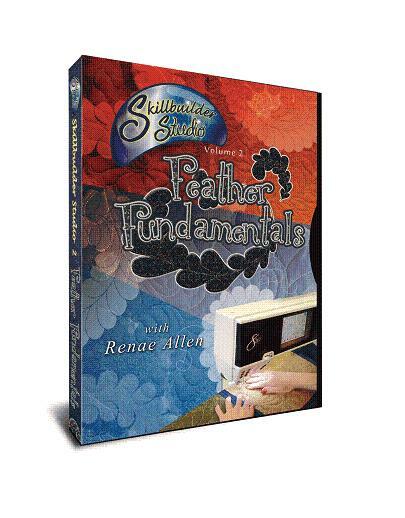 Feather FUNdamentals teaches how to quilt the feather patterns everyone loves. Renae demonstrates 6 designs found on the Skillbuilder 2 fabric panel plus a quilt-as-you-go Feather Sampler and a delightful freehand Feather Border Sampler. Learn the tips, techniques and tools for transferring, marking, designing and quilting feathers while you build your confidence and skill by applying these easy-to-follow directions. Running time: approximately 120 minutes.